Dirty Bunny at the notary's office. We are exploring a couple of opportunities in Europe over the next few weeks, and our first potential project is in Berlin. The Reichstag dome at sunset. After lots of online searching, we found an unrenovated loft for sale in an old apartment building known locally as an "altbau". The space has planning permission to be turned into an apartment, and we've flown to Berlin to check it out. A mural on an apartment building in Kreuzberg. The loft is in Kreuzberg, an area that’s received a bit of media buzz over the last few years for it’s reputation as an edgy, bohemian, counterculture hub. We’ve rented an Airbnb near the loft for 6 nights. In order for us to assess this project's real potential, we need to get a handle on Kreuzberg, and Berlin in general. 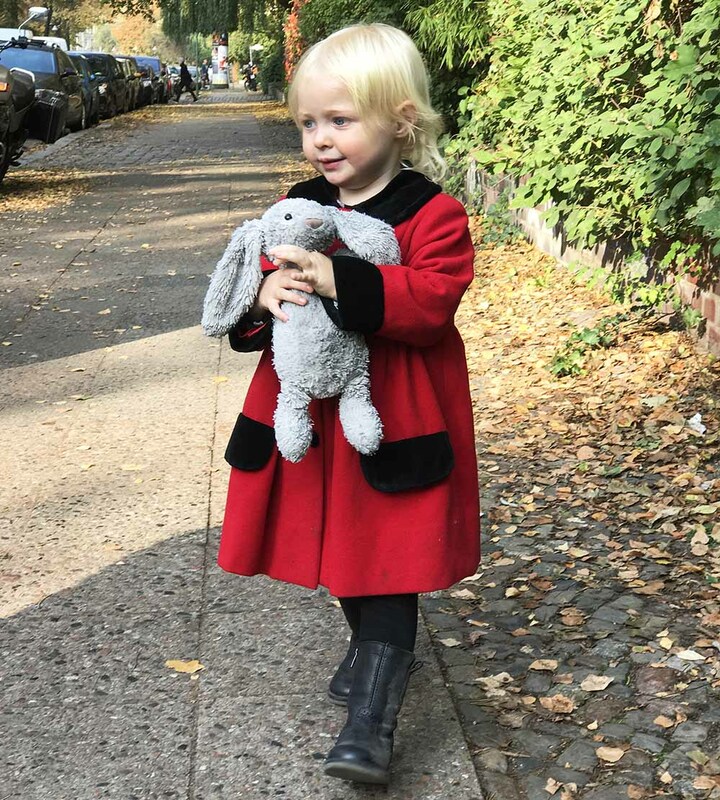 The Fall colors are so beautiful in Berlin at this time of year, but it's pretty chilly! After spending a fun and relaxing 72 hours in Paris, we arrived in Berlin in the evening. In advance of starting the 17 Day Diet, I had a traditional German wiener schnitzel for dinner, and we strolled around the neighborhood to get our bearings. Rosie is accompanying us on all our meetings on this trip, and our first appointment is at the loft. This will be the first time we’re seeing the property in person, as well as meeting the agents we’ve been dealing with remotely. The loft is better than we expected; it feels spacious, the areas of low head-height aren't as extensive as we feared, and we can see so much potential. We've basically fallen in love with it immediately, and I’m already designing the kitchen and bathrooms in my head before we finish the first viewing! But we can't get ahead of ourselves... We need to view a few more properties to make sure we have a handle on the comparables. This is another apartment we visited as a comparison. I was shocked to learn that this is considered a "kitchen" in a Berlin rental (and this apartment was not cheap). Apparently it's commonplace for renters in Berlin to bring their own kitchen when they move into an apartment. BYO kitchen?! We need to gather as much information as we can about property dealings in Germany, the real estate market in Berlin, and what to expect from a construction project in an altbau in Kreuzberg. So we schedule follow up meetings with lawyers, contractors, estate agents, and a notary. It was a huge relief that no one seemed even remotely fazed by Rosie accompanying us to all these meetings. We did our best to make sure she was well rested, which meant scheduling all our meetings for the morning or late afternoon so we could be back at the Airbnb for her midday nap. We also came prepared with snacks and toys to keep her occupied; a bit like what we do on a plane. I always had a sneaky banana hidden in my handbag - the ultimate treat for banana-obsessed Rosie. 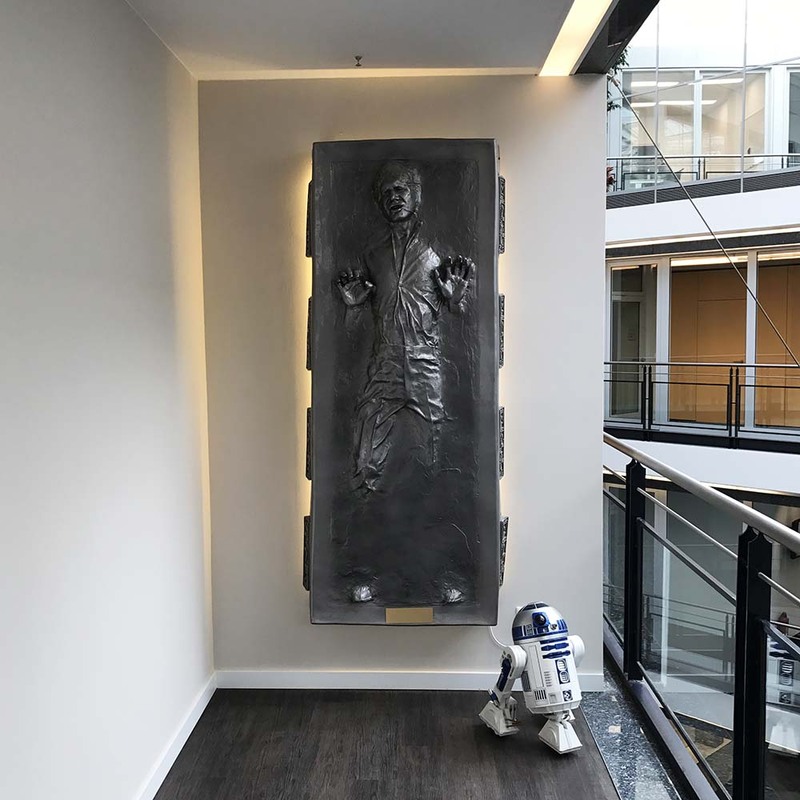 I'm guessing our lawyer is a bit of a Star Wars fan? Getting planning permission for this sort of project in Berlin takes around 12 months, with no guarantee of success. So the fact that this loft comes with planning permission is a huge advantage, and alleviates a lot of the risk. However, the floorplan that has been proposed to get the approval makes no sense to us. The open-plan kitchen/living/dining area has been squashed into the narrowest part of the apartment, and there are three bedrooms all sharing one bathroom. The suggested floorplan... If we go ahead with the project, our version will look very different! Another major consideration is the fact that the loft needs a new roof! We're going to need to figure out the cost implications of replacing an entire roof, and whether or not this sort of work can be done during the freezing winter months. Checking out the loft for a second time. After a second viewing of the loft, we have a pretty clear idea of what we'd do with the space. No prizes for guessing that there is more than one bathroom in our vision! I've also started a Pinterest board to collect ideas on how we could deal with the areas of low head-height. In between meetings and research, we actually managed to fit in quite a lot of exploring. 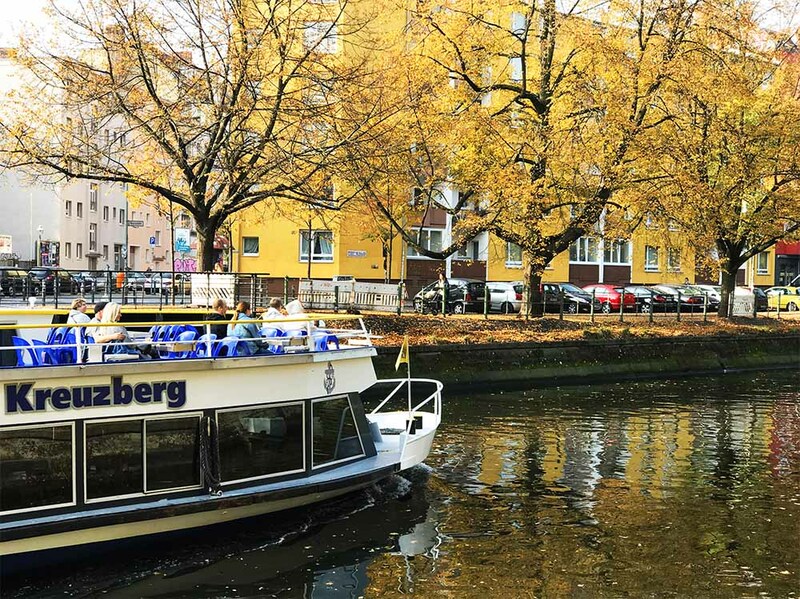 We enjoyed long walks through various city parks, and along the canal in Kreuzberg. We visited the Checkpoint Charlie, Brandenburg Gate and the Reichstag dome. We hung out a super hip rooftop bar, and traversed the trendy Sunday flea market at Mauerpark. There's a lot more I'd like to do on our next visit, but we managed to get a really good taste of the city. 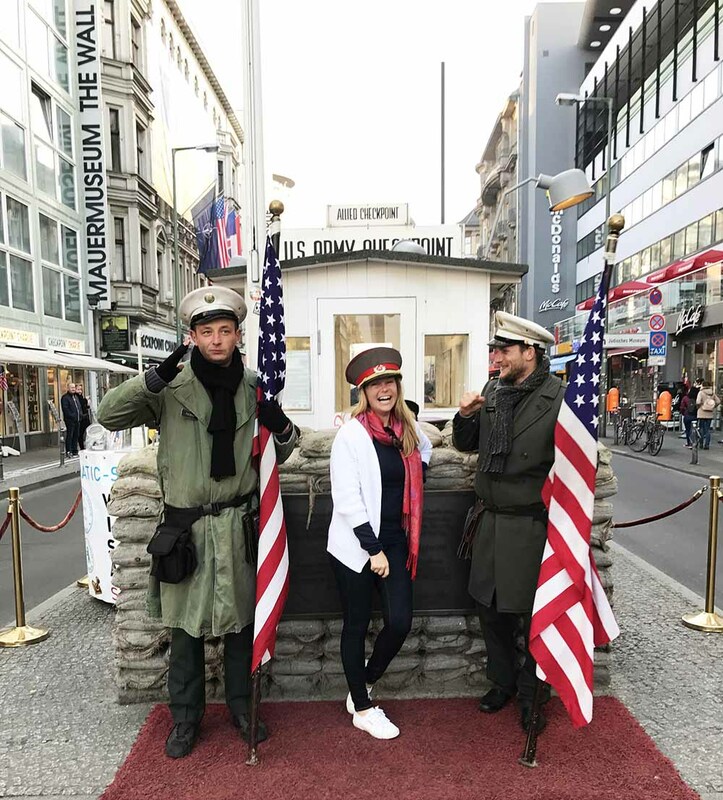 It's hard to imagine the tension that pervaded this city when Checkpoint Charlie represented a standoff between nuclear armed superpowers, and separated East and West Berlin. Thankfully the dark days of the cold war are behind us, and this historic crossing point is now a tourist attraction. The "soldiers" here today are cracking jokes with visitors like me, but it's also a reminder of a dreadful period in history that we should learn from and take care to remember. This property has so much potential. Now we need to do more research, spread-sheeting, and budgeting to assess whether our gut instincts match reality. I have a feeling we'll be back in Berlin soon... Stay tuned for an update on how this project unfolds! Klunkerkranich. A colorful rooftop bar with live DJ and a sandpit for kids!